Why replace your roof when you can restore it for less than half the cost. Cool roofs are roof surfaces that reflect more sunlight and heat than the standard rooftop. It is fluid-applied and multi-layered to create a seamless, waterproof seal over an existing traditional roof. The types of roof coatings we use most often include Astec, UNIFLEX, Quest Hydro Stop. 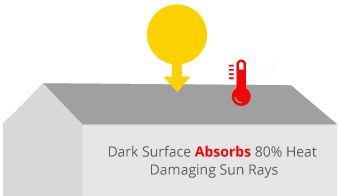 When roof materials reach summer temperatures of 140 degrees or more, they expand. At night when it gets cooler or when it rains causes roof material to contract. This expanding and contracting over time causes the fasteners and seams to become loose and to separate from roof structure, allowing water to intrude into the building. Cool roof technology takes advantage of cool roofing materials with reflective, weatherproofing that protects your roof surface against heat’s degrading effects, causing leaks. For about half the cost of roof replacement you can install a cool roofing system with a heat reflecting waterproof barrier, which prevents your roof from leaking – and also cools the interior of the building it covers and can significantly reduce energy costs. With a cool roof coating and regular maintenance it’s possible to have one roof for life. 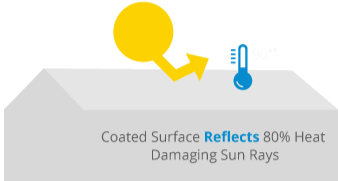 Restore and protect your cool coated roof with six layers of protection.